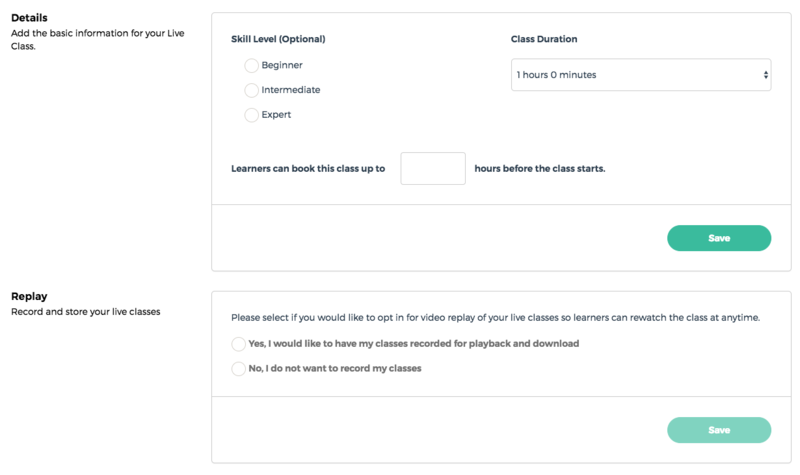 To create a Live Class, navigate to the Lessons page from the Course Content. And select Add Live Class. Firstly, we need to add the details of the Live Class to our lesson. Choose what level this Live Class is aimed for. This is optional but it helps the Learner know the level of difficulty to expect. Set the Length of the class. This can be between 1 and 3 hours. Then set how long before the class starts can a Learner book a class. This is also the best point to enable/disable HowNow replays, allowing Learners to rewatch their Live Class back at a later date. After adding the details for your Live Class, it's time to add the availability of your Instructor to this lesson. Press the Add Availability from the top navigation. Select whether the class is a One-to-one or Group class. Up to 8 Learners can join a group class. Then, from the drop down select the date and time you'd like to make available. You can choose to repeat this class daily, weekly, monthly or not at all. If you'd like to add more dates to your availability, press the Add Availability button to repeat the process. When complete, press the Publish Lesson button in the top navigation.